I’m noticing the difference all throughout my daily life. I always buy Nyah the 30 pound bag of dog food. It’s usually quite a struggle to get it up the steep seemingly 90 degree angled stairs that lead up to my second floor apartment. The other day I carried the heavy dog food bag up the porch stairs in one hand with all the groceries in the other. “Dang It !” I muttered to myself, I must have mistakenly bought the smaller bag of dog food. I squatted down and looked at the bag and read the label, nope it was the regular 30 pound bag. Wow! I guess swinging the 25 pound kettle bell and lifting 35 pound weighted bars above my head routinely during these training sessions is making everyday life tasks seem much easier. 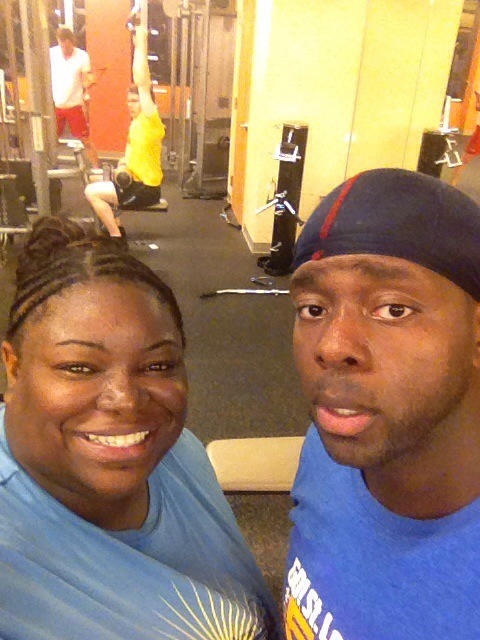 I took my Gym Cousin with me to my last training session so he could meet my trainer and see what one of my sessions was like. We tossed around the big white ropes you always see people training with on TV weight-loss shows, but surprisingly they were not as heavy as I remembered them. However, my cousin thought they were awful. Well, he actually said something else, but for my PG blog we’ll just say he said they were awful LOL. We did rounds and circuits of everything, planks, bicycling while lifting dumbbells, free weights, squats, push ups and more. What Does She have me doing? Later, when I looked in the mirror at my stomach, I noticed it was starting to look a little….hmmmm…..I can’t think of the right word….. maybe deflated? Normally, probably as recently as a month or two ago, that probably would have discouraged me and completely freaked me out. I probably would’ve told myself If I’m going to look gross and deflated and saggy I might as will just stay fat. But, realistically, I don’t know what I’m going to look like when this is all over with; my body is literally changing every day. I’ve had to get very comfortable with it changing and very comfortable with not associating my identity with my body because I don’t know what it’s going to look like from day today. Even being huge and more than 100 pounds overweight, when you get up in the morning you may not like what you see, but at least you pretty much know what to expect. It’s kind of weird to wake up and wonder who am I going to see in the mirror today? Whose body is this? When I washed my face this morning, I felt a little less fullness and my chin. That was weird, even my face feels different in my own hands. Don’t get me wrong, I’m definitely not complaining, I feel great! I’ve worked very hard and wanted these changes for a long time. It’s just an adjustment. For so long I allowed my body and my weight to define me as a person and it’s just a gradual learning process to allow myself to be comfortable with letting all of that go and embracing who I truly am beyond my physical self. Way to go Carli, I started working with heavier weights a year ago and even though the scale has not changed much my body sure has! I only step on the scale now at the doctors office and the rest of the time I ignore it. The strength and energy I have now from adding weight training to my aerobic workout have made me feel invincible…at least until I bump the weight up! I keep going a bit higher as soon as the weights start to feel easy, I see women older than me lifting even heavier weights and they inspire me! Keep going, stay strong! You are totally my inspiration!